Updates to the 2021 International Energy Conservation Code (IECC) are currently underway. NBI is drawing on deep experience in advanced energy code development and implementation in cities and states, as well as past success in the IECC process to achieve more than a 10-15% efficiency improvement. Along with a broad group of partners, NBI has developed roughly 30 code proposals that if adopted will improve energy efficiency in the IECC and put us on a glide path to lower energy costs and higher property values, better comfort and productivity, and lower carbon emissions from buildings. A recent blog from NBI Program Director Amy Cortese outlines compelling reasons for the importance of this proposed increase. Watch an on-demand webinar from NBI and the Energy Efficiency Codes Council to hear from experts working on the 2021 IECC update. The session explains the IECC process and proposed changes and how you can get involved. To further support cities, counties and states that want to spark better energy efficiency and lower carbon emissions from local building stock, NBI has developed a State and Local Government Toolkit that includes select resources from nonprofit efficiency groups, governmental entities, and others working for better building efficiency. The Toolkit directs governments planning and developing energy and climate action policies and programs to four strategy areas including: 1) upgrading publicly owned existing buildings, 2) ensuring all new buildings are constructed as ultra-low energy buildings, 3) instituting policies that drive energy optimization in the built environment, and 4) ways to communicate, educate and celebrate progress. Cities, counties, state agencies, school districts, and other governing bodies can use this toolkit to lead by example by getting on a path to ultra-low/zero energy and carbon in their own buildings as well as policies that impact buildings in their community. Targets for zero energy and zero carbon outcomes are growing exponentially. Recently, Grand View Research Inc. forecast $78.8 billion of growth in the global zero energy (ZE) building market by 2025. That’s compared to $8.04 billion in 2016, according to the report. NBI has been tracking the ZE building sector for nearly a decade and our annual Zero Energy Buildings List is j ust about complete! Typically a printed, static list, this year’s zero energy buildings inventory will be shared as a dynamic online tool allowing users to access the most current data every day of the year. The Getting to Zero Buildings Database will allow users to see a map and list of ZE projects across North America and generate custom graphics and analytics based on location, building type, age, ownership, and more. Learn about the current status of ZE buildings during a May 9 webinar where NBI Research Director Cathy Higgins with share current project counts and trends, and Senior Program Manager Alexi Miller will demonstrate the new tool. Also presenting is Clay Nesler, Vice President, Global Sustainability and Industry Initiatives at Johnson Controls, who will be presenting findings from the 2018 Energy Efficiency Indicator Study , a survey of 1,900 facility and energy management executives in 20 countries evaluating global market trends driving investment in energy efficiency, renewable energy and smart building technologies. What’s your number? 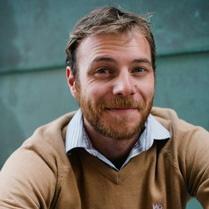 Don’t miss getting your building on the Getting to Zero Buildings List. Submit your ultra-low and zero energy project information and have your numbers shared! NBI maintains the most comprehensive list of zero energy verified, emerging and ultra-low energy buildings in North America and we are always seeking new projects to add to our new online database tool. On March 15, an estimated 1.4 million young people from 123 countries did not go to school, but rather rallied to demand stronger climate action to protect the environment for their future. Ironically, the school buildings where these students spend their days offer one of the best opportunities for cutting carbon emissions from the built environment. Buildings account for 39% of carbon globally and leading districts are working now to achieve zero energy (ZE) and even zero carbon performance in their schools. ZE buildings use only as much power as can be generated by clean, renewable resources, and ZE schools represent the largest segment in this market, showing a remarkable 850% growth since 2010, according to tracking by NBI and summarized in the recently released 2019 Zero Energy Schools Watchlist for K-12 Schools, Colleges, and Educational Projects . Want to learn more about how schools are leading in Getting to Zero? 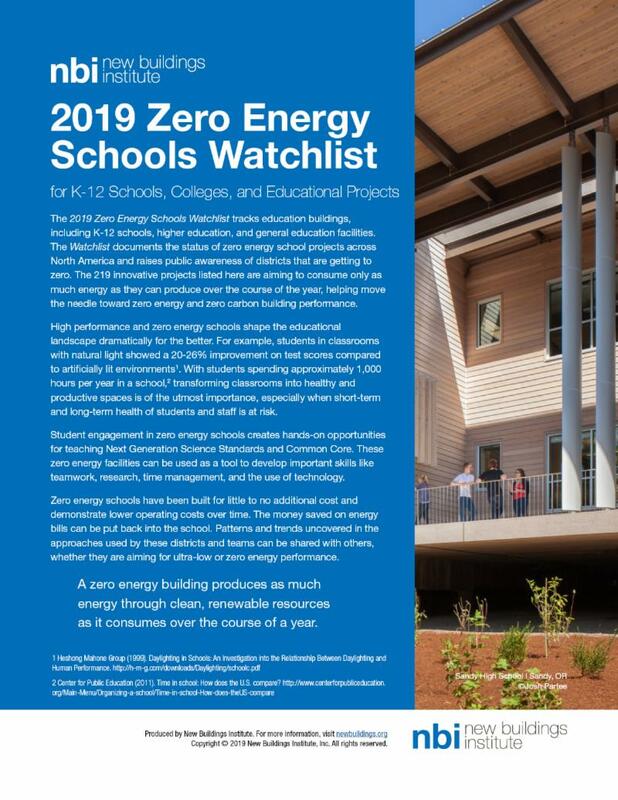 Visit our Zero Energy Schools Resource Hub highlighting state policies and national programs working toward ZE schools; districts pursuing ZE goals and the strategies they use to achieve this target; feasibility studies, assessment strategies, and other technical looks at design; and case studies of successful ZE school buildings. The incorporation of the NBI Multifamily Guide into LEED 4.1 continues a long collaboration between NBI and USGBC. NBI’s E*Benchmark and Core Performance Guide were included in previous editions of LEED and the New Construction Guide continues to provide prescriptive options to meet energy prerequisites and earn additional credits in LEED for small commercial projects. 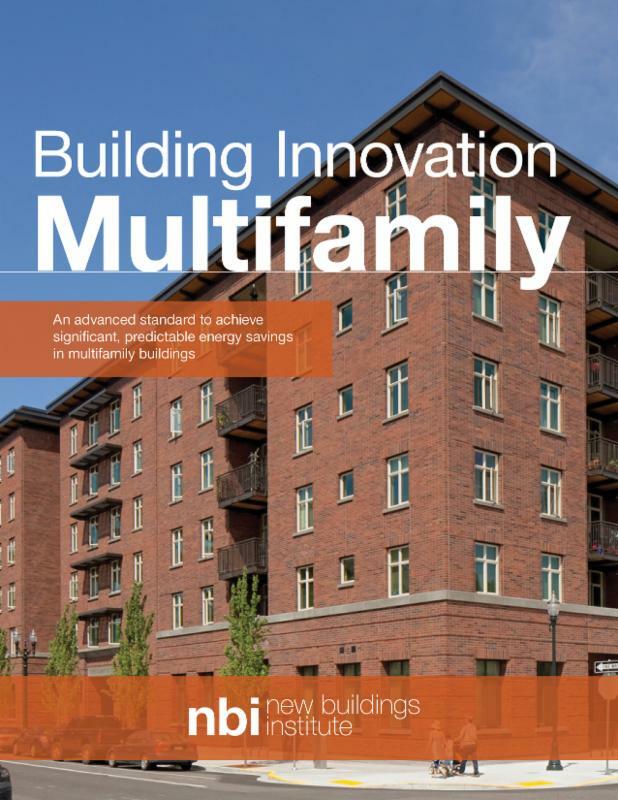 The Multifamily Guide was developed as part of the Building and Program Innovation suite of design tools and is free to access through an easy-to-use account set up. We are inspired by breadth of work related to zero energy and zero carbon buildings that was shared through the record number of Call for Speaker submissions for the 2019 Getting to Zero Forum this Oct. 9-11 in Oakland! While we work with our program advisors on reviewing proposals, we are continuing to plan our program tours, workshops and keynote speakers. 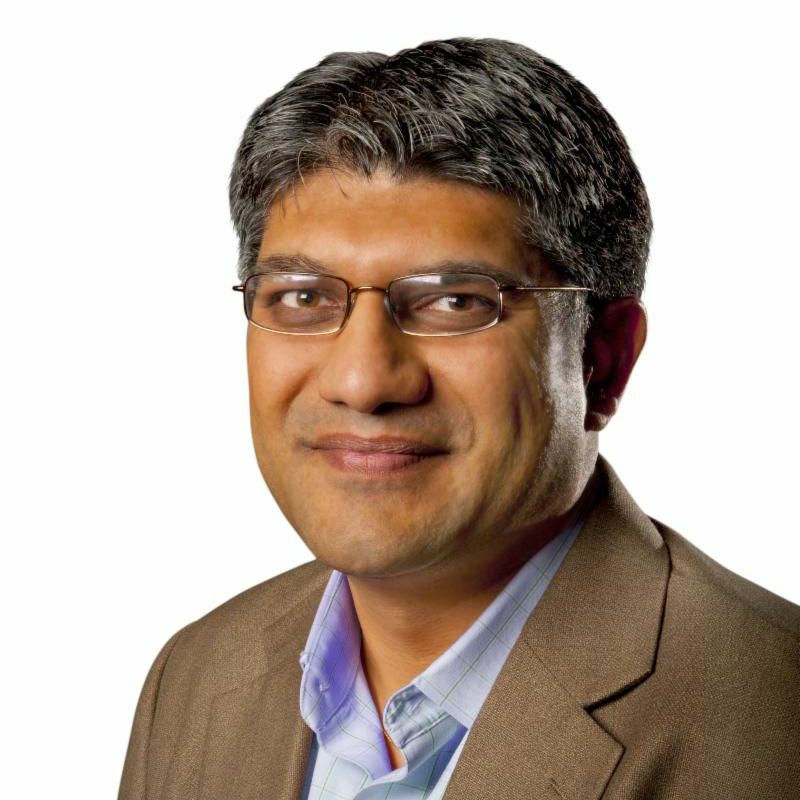 We are excited to announce that Jigar Shah, Co-Founder and President of Generate Capital , will be a keynote for our event. Jigar Shah is an Executive with broad experience in all aspects of the renewable electricity, resource efficiency, and climate solutions. Jigar Shah is focused on deployment barriers of well tested solutions in distributed energy, food, water, and transportation. Stay tuned for other annoucements including Early Bird Registration and discounted room rate links. Without upgrading our existing buildings to higher efficiency technologies we have zero hope of getting to zero energy (ZE)--or at least ultra-low energy performance--and our carbon reduction targets. We know that there are many roads to retrofits but rapid scaling relies in part on the commercialization of new technologies, integrated applications of existing products, and pure research and development. ﻿So where are the technology priorities and gaps to help get to zero energy buildings, and where is further investment needed? That was the subject of an extensive study analyzing technology gaps* led by Itron with NBI, EPRI, Integral Group, Davis Energy Group, and UC Davis for the California Energy Commission (CEC) in 2018. This program will also be simple and convenient for utility program adoption and is intended to dramatically increase the opportunity for utility program administrators to leverage the solid HERS infrastructure . 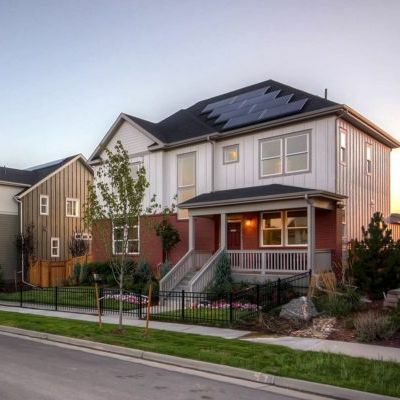 This includes HERS Accredited Rating Software, HERS Raters, and HERS Index as a way to scale incentives for high-performance homes in their service territories. The National Institute of Building Sciences (NIBS) and NBI have developed a new web-based tool, with support from the DOE and NEEA, to help jurisdictions tackle energy use in buildings. Cities require comprehensive strategies that include policies, programs, administrative resources, tools and on-going funding sources. Up until now, no single resource has described how these pieces relate to each other or how to implement them as a coherent whole. The tool is available at the WBDG Whole Building Design Guide ® website. The GridOptimal Buildings Initiative is a national coalition of utilities, nonprofits and other partners working to ensure better integration of buildings with smart controls and onsite solar generation into the utility grid. Learn more about the project team’s progress is developing metrics by which building features and operating characteristics can be measured and quantified at our on-demand webinar. The U.S. General Services Administration (GSA) Green Building Advisory Committee, Building-Grid Integration Task Group (BGI TG) has provided policy recommendations to the GSA that support opportunities to advance grid-integrated buildings. Actions would yield benefits in terms of reduced infrastructure investment, energy use, and pollution, the letter says. Growth of the commercial net zero construction market is vital to the high performance and zero carbon future. In this on-demand webinar, NBI staff members Cathy Higgins and Alexi Miller report trends and case studies of net zero construction across the United States. 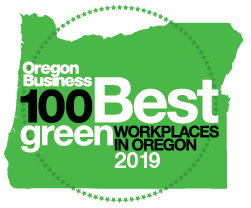 Oregon Business has recognized NBI as a top green workplace in Oregon. Winners are determined by an anonymous employee survey and an independent assessment of the employer's sustainability practices. Find out more about the award and the latest developments at NBI in our In the News section. Recent news includes the links to various publications featuring NBI thought leadership, and press releases on project work.